Make no mistake — U.S. troops will forever be attacked and killed as long as they are in Afghanistan, like the four U.S. troops killed in September. The eventual drawdown outlined in the agreement, in other words, ends with permanent U.S. bases and permanently garrisoned U.S. troops. Like all the other promised drawdowns in the past, this one too is subject to change. The millionaire politicians in Washington have decided on their own that the country’s longest war, which has long been opposed by a large majority of the U.S. public and troops, will never end. In recent months the insurgency in Afghanistan has increased its attacks. That is what awaits the remaining troops abandoned forever in Afghanistan. Those nine U.S. bases will never cease to be targets of a widespread armed insurgency that was mostly undeterred even by the largest-scale U.S. military operations. It was a much-anticipated and widely watched speech. Public opinion, inside and outside the military, wanted the long war to end. Everything about the speech was chosen tactically, from the venue to the words. Everything was explained carefully. He delivered the news people did not want to hear. I watched that speech in a room full of military families, whose loved ones had been on repeated deployments to Iraq and Afghanistan for the past eight years. Some had been wounded, most saw them change with PTSD, and some had been killed. They all cried and held each other when the President explained that the war wasn’t ending now, as they were hoping. It would instead intensify, greatly increasing the number of troops on the ground to fight a growing insurgency. This was the main public message — we know you’re exhausted, but it will all be over soon. Behind the scenes, the Pentagon and White House were forming a very different plan. The promise of a withdrawal in July 2011 was quickly abandoned and extended to 2014. When with withdrawal was supposed to begin in 2011, the Pentagon instead announced a surprise deployment of an additional 1,400 Marines. The President gave no major speech to service members and their families explaining why this had to happen. We continued to wait. The years 2009 to 2012 became, by far, the deadliest of the war. Soldiers and Marines prepared themselves for what they thought would be their last tour. Mobilizations against the war declined as there was a commonly-held belief that the war was at its end. Now we can see that was all a lie. How come the President, in reversing his promise and demanding the ultimate sacrifice from service members and their families, didn’t give a speech like he did at West Point in 2009? What happened to Biden’s “hell or high water”? In 2009, U.S. casualties were surging in Afghanistan and the hugely unpopular Iraq occupation was ongoing. The U.S. government had a lot of difficult public relations work based on anti-war sentiment among the population and the growing body count that was making the headlines. It wasn’t our lives that Washington cared about. It was managing the political fallout and embarrassment. They used a carefully crafted speech to quell frustrations and give the impression that the end was in sight. The new agreement will mean permanent deployments, injury and death. They are hoping to sweep it under the rug, so that no one will make a big deal out of it or even notice — except for those tens of thousands of U.S. troops who will rotate in and out of the war. Just five days prior the U.S. government decided that U.S. troops would also start deploying back to occupy Iraq, a story that was also minimized in U.S. newspapers. Who cares what rich politicians say? Refuse to go! The occupation of Afghanistan, like Iraq, is based on lies and false rationales. The politicians and generals will continue to throw our lives away, regardless of the will of the people, without even an explanation why we must sacrifice indefinitely. Many U.S. service members have taken the correct and courageous stand to refuse to deploy to Afghanistan. That is the only option service members have left. 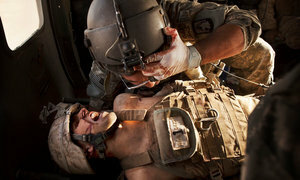 Only taking control of our own lives can end the pointless and unjust bleeding in Afghanistan.